See below for buying links and quotes from readers. Cry Purple, by Christine McDonald, is the story of the author's long journey from nearly two decades of homelessness, street-corner prostitution, crack addiction, and many stints in jail to her present life of total blindness, motherhood, and happiness. The first two-thirds of the book tell the grim story of her youthful unhappiness, how and when she got into prostitution and drug addiction, the horrendous levels of violence that she and some of her fellow prostitutes suffered, and how the drugs eventually reduced her to an almost animal-like state. It was only when she hit rock bottom that she finally found the will to seek help and change her ways. However, after getting clean and then engaged, she had numerous other difficulties and sorrows ahead of her: losing her sight due to a disease and having to have both her eyeballs removed, having a special-needs daughter that she had to give up for adoption due to her inability to care for her, watching her relationship with her children's father dissolve, and even losing the only really good job she ever had. 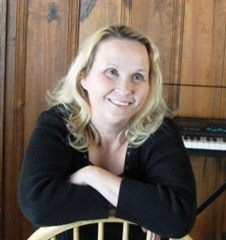 She currently lives in the St. Louis, Missouri area with her young son, Ricky. She practices an open adoption relationship with her daughter's adoptive parents, and is seeking new employment. She loves doing motivational speaking, and she does all she can to help and to advocate for the blind and those who have survived or are still living lives like her former one. 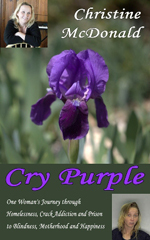 Cry Purple is available in both e-book and print from Amazon and other online sellers. Christine's hope is to raise enough money from book sales and donations for permanent housing for herself and her son. For more details, please see her website: www.crypurple.com There, you can click on the "Ways to get involved" tab to find how to contribute. Psychology Today magazine will be doing a review of Cry Purple and an interview with Christine. For years, Christine has been tirelessly advocating for the repeal of a harsh Missouri law, one that barred drug offenders from getting food stamps for life. At last her efforts have been crowned with success. See these links for an article and a news video about the law, its repeal, and Christine. The link below is to a program on Missouri Viewpoints, from 1/18/15, from LUTV, Lindenwood University TV. The segment on human trafficking featured Nanette Ward (first) and then Christine McDonald, along with the moderator, Mike Ferguson. Note: The television reporter states incorrectly that Cry Purple is available in stores. See below for purchasing information. A long article about Christine and her book appeared in Northeast News, "The online voice of Historic Northeast Kansas City." You can read the article here. Christine spoke to a Victims Rights Breakfast organized by the Saline County (Missouri) Prosecuting Attorney's Office. You can read about the speech here. "An eye-opening view of life on the streets and beyond, a journey from the pits of darkness to a life of hope." "Cry Purple is a story from the heart — a riveting memoir that will take you on a rollercoaster ride filled with sadness, adversity, pain, joy, and finally, peace." "I don't see much beautiful stuff. These poignant words from the title chapter pretty much sum up the first two-thirds of this book. By turns, it's fascinating, informative, horrifying, heartbreaking, and hopeful. The author's straightforward style makes her account of the brutality that she endured all the more hard-hitting. How could she possibly have survived all that with any optimism and resilience left? Yet she did, and to an amazing degree. I found the chapters about her two young children particularly moving. The shortest chapter, 'And He Is Only Three,' brought me to tears. It may not be the only part of this book that will have the same effect on you." "Christine McDonald's Cry Purple is a fascinating tale of salvation and redemption from a life of addiction, crime, and homelessness. The most inspiring story I've ever read. A must-read filled with hope!" "Surviving a hostile world, damaged emotionally and physically, Cry Purple chronicles a shattered life, rebuilt through sheer determination, courage and faith." "I purchased and read the entire thing last night before bed. Thank you for taking the time to write your memoirs. Your work has gotten me thinking on a number of levels, and that is what I always appreciate in literature, something to stimulate me to think about what I know and what I believe." A collection of very simple recipes for inexpensive dishes.